eos is celebrating spring with a new limited edition package illustrated by Clare Owen. With bountiful bouquets and adorable pets this quintessential marketplace comes to life. In response to the shrinking demand for snail mail, Canada Post has begun to phase in an expansion of it's Community Mailboxes (CMB's) vs door-to-door delivery. The process of developing the CMB's was carefully executed with a strategy that involved lots of consumer input through focus testing at various stages in the development. Canada Post was looking for the perfect CMB to take it's customers into the 21st Century. One of the key criteria for the new CMB's was to develop an art wrap that would hopefully work as an anti-graffiti barrier. This is where the call for Gary Alphonso's illustration talents came in. Working with the team at Ove Brand | Design, headed up by creative director Peter Baker, Gary Alphonso was given an open creative brief as they embarked on an exploration of various abstract directions. The art evolved into a beautiful ethereal design that incorporated the maple leaf (a ubiquitous Canadian symbol), floating as if being carried by a gentle wind. The process was a real contest but in the end, we are proud to report that Gary Alphonso's floating leaf design was among the most popular in focus testing. Gary Alphonso's illustration applied as a wrap to the mailboxes. Here are some pics of the mailboxes in communities across the country. View Gary Alphonso's entire portfolio here! 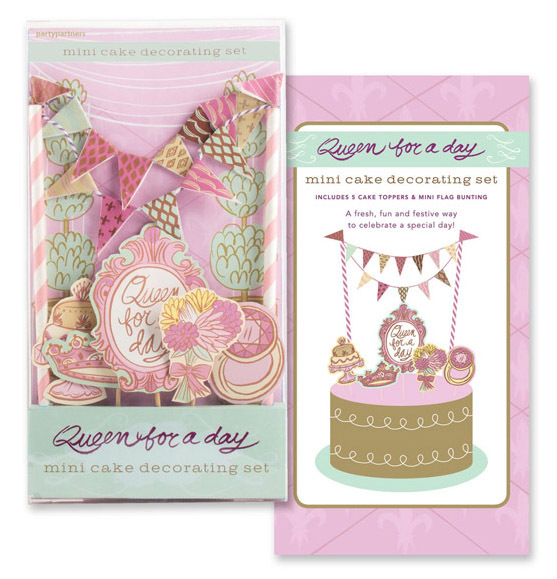 Katy Dockrill illustrated the Make a Wish and Queen for a Day bunting kits that are as sweet as the cake they're designed to adorn! Art director Timothy Siciliano of Party Partners fell in love with Katy's work when he discovered her surface design patterns and prints. Her line work is absolutely flirtatious and brings such a fun touch, fit for a party at any age! To see more of Katy's illustration visit her updated portfolio here. Working with Gayle Akler of Sparkplug Marketing and Communications, Tracy Walker created elements to showcase the Life Sciences start up, Scintelligence, whose purpose is to "work directly with industry, academia and other key stakeholders to bring prospective partners together..." The concept was all about growth and digging deeper and Tracy's organic and shapes and scientific iconography work perfectly to convey the message visually. The elaborate promotional package housed an actual shovel (with a sprinkling of dirt no less!) --to drive home the message which was further conveyed in the accompanying brochure. Print and Pattern features Tracy Walker! With SURTEX about a week away, we are delighted to share the post Print and Pattern (ultra popular surface design blog) featured on Tracy Walker. If you would like to meet Tracy and see more of her work please visit us at booth #340 at the Javits Center in NYC from May 19-21. We'd love to show you more of her work in person! We are excited to unveil this special postage stamp series created by Monika Melnychuk for Canada Post. Monika's whimsical line art style serves this playful concept, which features photography of actual homeless pets, in environments that could become reality--if only they are adopted. A brilliant example where the concept is the message! The would-be homes for these pets, are left up to the viewer to fill in, by adopting a pet! Working with Vancouver based design firm, Subplot, Monika illustrated the collectable Souvenir Sheet, Official First Day Cover, as well as the Five Collectable Stamps for Canada Post's Adopt-A-Pet campaign. It's great to see Canada Post using their currency to help bring awareness to such an important cause. In 2010, close to 150,000 homeless pets were admitted to shelters across Canada. Partnering with the CFHS, Canada Post wanted to create awareness around the need for animal lovers to adopt from their local Humane Society or SPCA, and give homes to animals who so desperately need them. As of today, April 22 2013, the full package below can be purchased through Canada Post--the collectable Souvenir Sheet Official First Day Cover, complete with all five Canadian stamps. Project Director: Danielle Trottier, Canada Post. Designer, Ross Chandler, of Subplot. Creative Directors: Roy White and Matthew Clark of Subplot Inc. Photography by: Raeff Miles (cages) and Raina + Wilson (animals). i2i Art was approached by cider maker Jonathan Hull of Applewood Winery to have Monika Melnychuk create new packaging for their Hudson Valley Hard Cider, which was to be relaunched under the new name, Naked Flock. The product name was inspired by a very colorful, visual folk tale about a pastor who plants some poppy seeds and a flock of geese who eat the poppies and fall into a deep sleep. Thought dead the geese are plucked for their feathers--hence the name Naked Flock. Read the whole tale on Applewood Winery's website. Monika says, "This is one of my favorite projects to date. And the first project I have been hired to do the illustration and design as well. Naked Geese? The story is hilarious, so when I approached the project I wanted to create something funny, but a bit edgy as well." 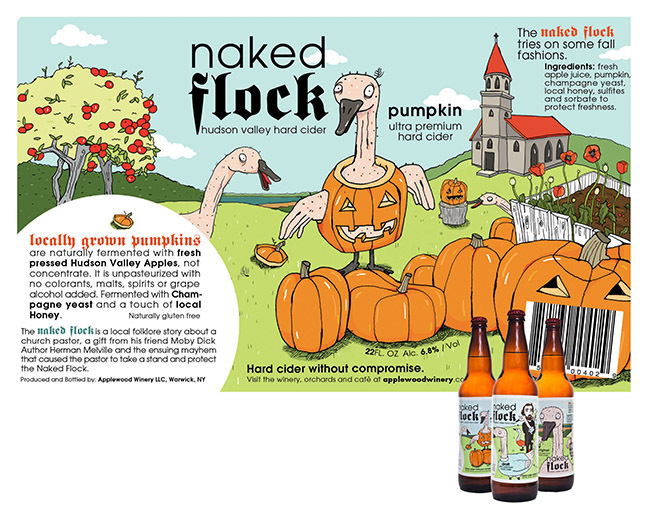 Monika designed the logo and labels and illustrated all three skus of Naked Flock Hard Cider: Original, Draft and Pumpkin. Tracy Walker worked with Working Format's Grace Partridge in creating the art for KOOSHOO's sustainably designed packaging. Vancouver based KOOSHOO recently launched their line of environmentally responsible yoga accessories and wanted to feature Tracy's natural elements along with diagrammatic illustrations to demonstrate the product's use on the packaging. The result, simply elegant packaging. Popular design blog The Dieline recently featured this beautiful new packaging. Package design, branding, art direction & photography: Working Format. Giulio created this fun image which was used extensively on all promo for a Blues Festival in Italy this August. We love the heart popping out of her mouth. It's a trademark surprise element done Giulio style! John Webster's New + Quirky! John Webster can't stop making lovely art. Kellogg's, Sony, EMI and Mirvish Productions are among his clients. John has a quirky eye, that mixed with his penchant for pop culture, give his collages a unique edge.